Counties across the country are in a continuous process of performance improvement. From running local health departments to overseeing elections, counties deliver a variety of services and represent an industry of half a trillion dollars in annual operations.1 Performance metrics have become especially important for counties in face of rising state and federal mandates, decreasing funding shared by states with counties and multiplying state limitations on counties’ ability to raise revenue. Evaluating programs can help streamline existing processes, encourage collaboration across departments and better manage limited resources. Tracking performance also allows residents to see the results of ongoing county efforts, as well as increase transparency, accountability and, ultimately, trust in county leadership. This report explores a variety of ways in which counties are tracking performance and using performance metrics to improve services for residents. Based on information collected through a combination of focus groups, live polls and interviews with county officials, this analysis showcases how counties around the country measure their performance, their successes and the challenges they face in the process. The report includes four case studies — Prince George’s County (Md. ), Catawba County (N.C.), Douglas County (Nev.) and McHenry County (Ill.) — that feature specific county performance evaluation processes in detail. These case studies are just a few examples of how counties across the nation conduct their performance measurement processes and increase the efficiency and impact of their services. Performance tracking involves both metrics and measures. Performance metrics help an organization evaluate compliance, process effectiveness and whether set objectives have been achieved.2 An essential characteristic of performance metrics is the evaluation against a baseline. The Federal Chief Information Officers Council (CIO Council) differentiates between compliance and process metrics.3 While compliance metrics are about evaluating progress of current work against set goals, process metrics consider business processes and the results of changing business practices. Most often, organizations keep track of workload measures, which are simply output tracking. While workload measures are useful in showing workload volume and resource utilization, they are not metrics, as they do not require a measurement baseline. No two counties are the same, resulting in a variety of methods to evaluate performance. Based on their specific situations, each county government selects the focus of their performance evaluations, the way they will organize their performance tracking process and the way they will use the evaluation results. Despite these differences, the goal of evaluating performance remains the same: improve outcomes and increase efficiency within the county – two increasingly difficult, yet necessary, objectives for counties operating in an environment of fiscal constraints. 84% of respondents mentioned that their county tracks performance. Most counties have some type of formal performance evaluation. According to the 2017 NACo live polls and survey of appointed and elected county officials (referred to as the “NACo survey” in this report), 84 percent of respondents mentioned that their county tracks performance.4 Most often, counties evaluate financial performance, as nearly half (47 percent) of respondents indicated.5 Resident satisfaction and county employee engagement are next on the list. Additionally, nearly one quarter of respondents mentioned that their county also tracks socioeconomic trends across the entire county jurisdiction. The focus of the performance evaluation process depends on the county’s top priorities, and it is often not singular since, for example, strong financial performance may lead to increased resident satisfaction. Every county has its own set of priorities which guide its performance evaluation process. Most often, counties use the results of the performance evaluation to identify priorities for future budgeting (See Figure 1). Identifying demand for county services is another purpose of performance tracking, which helps counties better allocate resources and plan for future growth. Using performance metrics to inform county residents (20 percent) contributes to an environment of increased transparency and accountability. Performance metrics, when they are similar across counties, may be used for benchmarking, which can give another measurement baseline and help counties find areas where they can cooperate on issues. Note: The respondents were asked to select only their top two purposes. Counties organize the performance evaluation process in a variety of ways. Nearly half (48 percent) of respondents indicated that their counties organize the evaluation process by county department. This format is often easier as it aligns with budgeting reporting. Activities of similar nature may take place across departments, so about a fifth of respondents mentioned their counties organize their performance tracking by county function – such as human services or public safety. A similar number centralize the process, evaluating the county government as a whole. Some counties track performance beyond county government and evaluate how the entire community has been improving on metrics such as poverty rates or number of new businesses created. The top challenges for counties are collecting the data needed to measure performance and creating the right performance metrics and measures. A formal process for managing performance comes with its own difficulties. The top challenges for counties, identified by about a third of respondents, are collecting the data needed to measure performance and creating the right performance metrics and measures (See Figure 2). Most often, counties use either data collected internally or data that are publicly available for their performance evaluations. Each county department generally conducts the performance evaluation, which can result in differences in the structure of performance reporting across departments. Sometimes, counties contract a third party or create a specialized unit within the county (such as a “CountyStat” program) to work with the county departments to organize the performance measurement process. Bureaucratic processes or the usefulness of performance metrics were other challenges mentioned by some respondents. For example, some county officials from small counties – those with less than 50,000 residents – consider a formal performance measurement process unnecessary. In small counties, county officials are in close interaction with employees and residents, so the results of the county’s work are immediately apparent to residents and to county leaders. Note: The respondents were asked to select only their top two challenges. County leaders can tailor the performance evaluation process to better meet the needs of their county government and its residents. With their county’s priorities and resources in mind, county leaders can decide on what they should focus for performance tracking, what kinds of metrics to track, how to organize the process and how to use the evaluation results to manage performance. The following section presents some examples of counties of varied sizes employing a formal performance evaluation process. Case Study: Prince George’s County, Md. Interviewees: Mr. Benjamin Birge, CountyStat Manager, Prince George’s County, Md., and Linda Turner, Program Director, Transforming Neighborhoods Initiative (TNI), Prince George’s County, Md. Under the leadership of County Executive Rushern L. Baker III, Prince George’s County decided to improve government transparency and accountability, which included the creation of the CountyStat team. This focus on performance evaluation and evidence-based decision-making has been instrumental in tackling the toughest challenges in the county through programs such as the Transforming Neighborhoods Initiative (TNI). – Hon. Rushern L. Baker III, County Executive Prince George’s County, Md. Based within Prince George’s County Executive’s Office, CountyStat is Prince George’s County’s policy research and data analytics division. The program functions as the county’s performance measurement unit and is dedicated to improving county operations and management. In addition to measuring the county’s performance, CountyStat has contributed to improvements in the county by providing measurement support to TNI. Mr. Benjamin Birge, CountyStat Manager and former County Deputy Budget Director, was tasked with the management of CountyStat in 2013. The program had been operating for about two years. As a first step, Mr. Birge reoriented CountyStat’s data focus around the budgeted priorities of the county agencies. In addition to listing their expenditures, the CountyStat team asked agencies to include in their budget requests the data that support their priorities. County agencies identified several indicators such as their most important obligations, the number of employees required to meet those responsibilities, the agency’s overall workload and the amount of resources needed. While some agencies perceived this type of analysis a way to cut budgets, most have embraced it and see it useful to demonstrate needed resources. The assessment process progressed in three phases. The first phase focused on analyzing workflows and procedures of different agencies to ascertain where improvements were needed. The CountyStat team recognized that the county’s data collection processes were not consistent across agencies. To ease the prioritization work for agencies, the office aligned its processes with the budgeting department. Both departments now work together closely, which, in turn, allows other agencies to prioritize their needs better. Next, the CountyStat team focused on improving the transparency and the quality of county services to residents. The second phase involved the creation of a complete catalogue of services provided by every county department and agency. Prompted by the creation of a list of county services that would be most relevant to the TNI implementation, CountyStat ended up compiling a catalogue of all county services in 2013. This list is now a comprehensive directory of all 625 county services that includes service descriptions, what data are used to support a service, how those data were collected and how and where those data are stored. Finally, the third phase resulted in the installation of the county’s new 311-system in 2016, along with the analysis of the 311 data. This new system – replacing the original 311-system established in 2012 – not only captures information on service requests through phone calls and the CountyClick website, but shows how quickly service requests are processed. In this way, the 311-system provides a picture of the entire workflow process down to the employee level. This system has amplified the impact of CountyStat, providing the opportunity to analyze a new set of data on service requests and residents’ perception of county service delivery. The 311 data analysis shows the level of effectiveness of procedures in place and facilitates the creation of better measures of efficiency and effectiveness regarding services and government operations. After the county experienced 14 homicides in January 2011, county leadership and public safety officials became determined to apply a different strategy to address the root causes of crime in neighborhoods highly affected by violent crime. Prince George’s County launched TNI in 2012 as a partnership between the county and community leaders to raise the quality of life and address the deepest challenges in troubled communities. CountyStat has been instrumental to TNI since the beginning. The program has been providing analytical support to TNI and has played a significant role in determining which neighborhoods were most at-risk. The CountyStat Team developed a model to analyze a variety of indicators – such as unemployment rates, crime rates and absentee rates – for the entire county by neighborhood (census tract). At the start of the program, the Chief Administrative Officer made recommendations to the County Executive for the selection of target neighborhoods based on the analytical results, as well as the amount of resources needed for each TNI area. After the first class of neighborhoods transitioned out of TNI, the CountyStat Team identified, based on the results of the model, subsequent groups of neighborhoods to be part of the program. This targeted, evidence-based approach increased the likelihood of the success of the initiative. The county employs this analytical model to evaluate whether the county should continue running the TNI program in a focus area. CountyStat keeps track of the selected indicators across neighborhoods and, based on the improvement in a TNI area, the TNI program leaders make recommendations to transition out of that community and focus on a different neighborhood. The CountyStat team proposes their recommendations for indicators to be monitored and Prince George’s County’s executive leadership makes the final decision. The county still maintains contact with community leaders in communities that transitioned from the TNI program, and TNI program managers act as liaisons between the county government and community leaders. In the first two years of the improved service tracking system, the county increased on-time completion from 86 percent to 94 percent. CountyStat has proven useful in improving county management and operations throughout Prince George’s County. For instance, when an agency or department is having an issue with compliance, CountyStat can help determine whether the problem is employee-related or about the process of the agency. CountyStat contributes to the strengthening of the operations and structures of agencies by informing them of any concerns the CountyStat team discovers in the data and collaborating with them to solve those issues. One of the most valuable results from the rollout of the CountyStat program has been the improved level of transparency across county agencies’ operations. CountyStat has been successful in contributing to reviews of the county’s public safety and corrections systems. The CountyStat team gathered geographic information regarding domestic violence cases in the county and mapped hot spots for domestic violence cases. This map was then compared to the map of domestic violence resources and it was shown that the services were located far from the victims. This information was used to modify contractual relationships with service providers to ensure services were physically located closer to the victims. The CountyStat team mapped workflows and 311 data on abandoned vehicles to inform a new policy on towing. With better use of existing technology, CountyStat eliminated over 2,000 abandoned vehicle complaints that were not valid, reduced the time for inspection/towing of valid complaints from five weeks to three days and redirected the communication of complaints to the correct parties. These efforts were integrated into legislation to change the towing policy within the county. With the help of CountyStat, the TNI program has grown from six TNI areas to nine: six government-led TNI areas and three community-led ones. The growth has included the addition of program managers who oversee the TNI neighborhoods and an associated team of government representatives. CountyStat has also allowed TNI program managers to categorize TNI areas as issue-based or geographically-based clusters. Despite its successes, CountyStat is not without its challenges. One challenge Mr. Birge mentioned is that the CountyStat staff members are often spread thin. As more county agencies learn of the CountyStat capacity, the demand for the team’s expertise increases, but CountyStat has not yet been able to hire more staff to meet the demand. Another challenge Mr. Birge noted was that, for some agencies, having access to a large database has slowed down some of their processes while they work to incorporate data analysis into their normal workload. Finally, CountyStat has encountered some resistance from county agencies, who assume that CountyStat data will work against them, rather than support their agency priorities. To overcome these challenges, Mr. Birge explained that strong and consistent support from the county’s leadership – especially, County Executive Baker – has been of paramount importance. With support from the county’s leadership, CountyStat was able to align performance measurement with the county’s budgeting process and embed it in government operations. CountyStat’s use of the county’s 311-system was also highly successful in helping gather data – so much so, that Mr. Birge suggested that any other county with a 311-system could begin to build a system like CountyStat simply by examining the most common requests from citizens. With CountyStat’s help, Prince George’s County’s agencies have been able to prioritize their work better, increase the efficiency and effectiveness of their operations and, ultimately, strengthen the development of healthy and safe communities. Case Study: McHenry County, Ill.
Interviewee: Peter Austin, County Administrator, McHenry County, Ill. Located in northern Illinois, McHenry County is home to over 300,000 residents, and the manufacturing and retail industries drive its economy.8 The county operates a “no growth” budget, meaning it aims to provide services without raising costs. This budget strategy compounds the fiscally constrained environment in which Illinois counties already find themselves, with decreased state funding to counties and statutory limitations on counties’ ability to raise property tax revenue.9 Hence, when monitoring performance, McHenry County must be especially conscientious of the costs associated with the measurement process and the ways their metrics can be used to improve efficiency and service delivery. – Peter Austin, County Administrator, McHenry County, Ill.
McHenry County’s performance measurement process is integrated into the budgeting process to ensure the optimal utilization of resources across departments while keeping up with the “no growth” constraint. Peter Austin, McHenry County Administrator, described the county’s performance metrics program as “an evolved way of thinking” because of its direct tie to the budget. The county primarily uses data collected internally to facilitate the budgeting process, with the overall goal of ensuring that financial resources are being utilized efficiently. The budget document contains performance indicators specific to departmental functions, goals and objectives. These indicators measure workload or activity and facilitate year-over-year comparisons. These measures include, but are not limited to, the number of ordinance violations filed with the Clerk of the Circuit Court, the number of invoices processed by the County Auditor and the number of business registrations filed with the County Clerk. By and large, each department contributes material and data related to their functions in the budget. This information is reported to upper level county management, such as the county board or county administrator, and facilitates the county’s budgeting procedure. Although measuring departmental outputs has proven fruitful, McHenry County also aims to analyze process metrics.10 For example, in the past, McHenry County collected how many miles of road were snow plowed; now, the county has expanded this measurement and examines the cost of plowing per mile. The former metric is a simple output measure, but the latter provides context on output relative to costs. An effective performance metrics program necessitates the development of meaningful measures that can facilitate comparisons against peer organizations or within an organization. For this reason, McHenry County looks beyond its own borders to compare itself with fellow county governments in the state. In 2014, McHenry County participated in a multi-county study organized by Bellwether LLC to provide a basis of comparison among Illinois counties. The study focused on a wide range of county services, including law/judicial services, highway department services and health department services. Although the study suffered from data collection issues outside the county’s control, it represented a step in the process of bringing Illinois counties together to measure performance and improve county services across the state. The performance metrics process helped the county identify staff needs. McHenry County operates a “no growth” budget and reduced the number of employees by over 18 percent between 2008 and 2016. During a time of relatively sluggish growth in the state, the county has continually made decisions about where to maintain or decrease existing staff levels. For instance, if the county implements technology or the performance metrics indicate that certain tasks can be completed with fewer people, the county reduces the staff levels in such circumstances. The county can make these decisions confidently as it monitors progress and other measures related to the activity. Despite their best efforts, McHenry County has faced some challenges in its approach to performance measurement. Currently, McHenry County compiles metrics on activity and workload with year-over-year comparisons. Their overall goal, however, is to measure effectiveness and efficiency across all departments using process metrics, thereby facilitating optimal resource utilization. Process metrics require more information to develop than activity and workload measures – information that the county does not always have readily available. Another challenge has been creating metrics that are comparable across county and state borders. Given the complex nature of local governments, benchmarking counties on a single dimension is insufficient; a variety of indicators is required to compare them accurately. The performance metrics process helped the county identify staff needs. A final challenge for McHenry County has been collecting the data needed to measure performance. Data collection requires considerable time and effort, so employees often see the tasks as laborious. McHenry County has tried multiple methods of data collection to facilitate the performance measurement process, including using a third-party consultant, collecting their own data and using a subscription-based system to benchmark its performance against other counties. Through continual development of the performance measurement process, McHenry County has been making incremental progress throughout the county. There are many different approaches to performance measurement, and counties customize the metrics they use to fit their needs. McHenry County learned that this customization is essential to success and that performance metrics can help drive significant budgetary decisions when examined on a regular basis. Case Study: Douglas County, Nev.
Interviewee: Ms. Lisa Granahan, Economic Vitality Manager, Douglas County, Nev. In the wake of the Great Recession, Douglas County, Nev., leadership sought a solution that would boost economic development. The county is one of more than 2,000 small counties in the nation (counties with less than 50,000 residents).11 Over a third of Douglas County’s jobs are in tourism and leisure – industries that were hit hard by the latest economic downturn.12 The county leadership decided it needed to take a more proactive role in revitalizing and diversifying the economy; thus, the county’s “Economic Vitality Plan” was born. – Lawrence Werner, County Manager of Douglas County, Nev. The goal of the Economic Vitality Plan (referred to as the “Plan” in this report) is to create an environment suitable for economic development, while simultaneously preserving the county’s scenery and beauty. Approved by the Board of County Commissioners in 2010, the Plan is a combination of prior plans that had been compiled over a period of ten years. Various stakeholders, such as county leaders and community residents, contributed to the development of these previous plans. County staff, in collaboration with a consultant, analyzed these plans and developed the common goals of fostering economic development while preserving the county’s natural beauty. 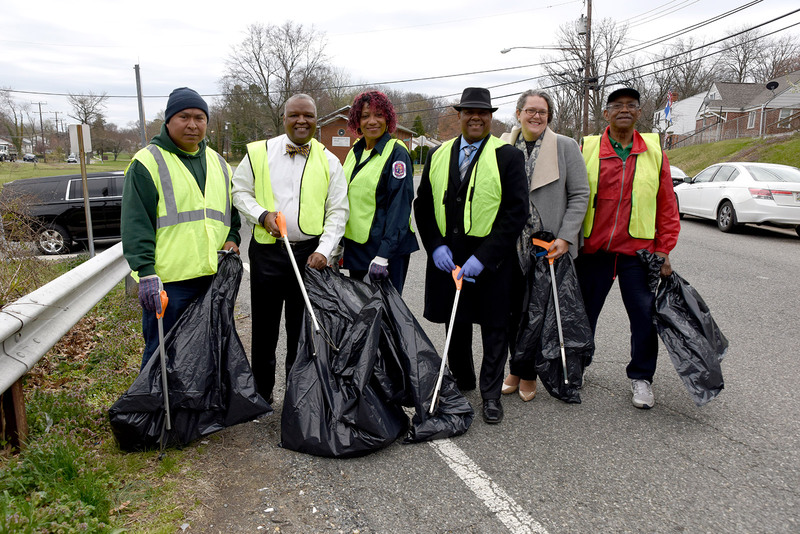 These goals served as a guiding strategy that aided the county in identifying several projects that would make a cultural, social, economic and environmental difference in their community. For example, the Plan included the development of four distinctive downtowns and the construction of a Science, Technology, Engineering and Math (STEM) center to foster an environment for business development and learning. These projects focus on revitalizing historic and distinctive downtowns, diversifying the industry makeup of the county, creating a prosperous environment for business and enhancing the workforce through education. An important part of measuring performance in any county is identifying priorities. An important part of measuring performance in any county is identifying priorities – something that Douglas County recognized from the start. As part of its outreach related to the countywide strategic plan, the county held its first Citizens Roundtable to engage county residents directly, allowing them to meet in person with county staff. Far more personal than a survey, it provides a deeper understanding of the needs present in the community and allows county leaders to direct the Plan accordingly. Douglas County hopes to expand the number of Citizens Roundtables in the future. When implementing the Plan, Douglas County recognized that government-led economic development was the old model, and only bold partnerships among businesses, government and the nonprofit sector would bring about change. The county brought together teams of four to eight stakeholders – most led by a member of the private sector (or “Champion”) – to head up specific projects. In developing the teams, the county decided that having long-term commitment from Champions would better foster change between organizations. The Champions of each team have had to commit that they will remain involved for the duration of the project. A county staff member represents the county government on each team. The long-term commitment made by both the county and its partners ensures the stability and longevity of the program beyond the tenure of elected county officials and staff. As part of the Plan’s process, the Champions and Ms. Lisa Granahan, Economic Vitality Manager of Douglas County, Nev., provide the Board of County Commissioners an update on their progress periodically. Built into the action plan for each project are metrics that allow the county to gauge the efficiency and success of the Plan. These metrics are specific to focus areas and/or projects; for example, for some projects the county measures job and wage growth, while for others it keeps track of educational achievement or the number of newly-created businesses. By matching the metrics to each project, Douglas County recognizes that different projects have different measures of success. As Ms. Granahan explained, proper timing, adequate resources and strong leadership are all key to making the public-private partnership model work. About every three years, county staff and Champions examine timing, resources and leadership commitment as they evaluate which projects are making progress, which are struggling and which are staying on course. Further, the county engages the local businesses and solicits their input to evaluate priorities. For example, through a 2016 survey the county found out that affordable housing was one of the main impediments to local businesses increasing their workforce. Douglas County, Nev., uses these evaluations to reorganize priorities and shift resources for the sake of maximizing their productivity and updating the Plan. For Douglas County, the largest challenge in using performance-based measures is the amount of time and resources required to prepare the progress report. The Economic Vitality Program has one full-time staff member to manage the operation and implementation of the Plan, as well as compile and analyze the performance measures. Consultant services assist with the gathering of data and preparation of the report. This staffing level means the program stays very focused on achievable projects, which are usually no more than eight at a time. Another set of challenges for Douglas County is collecting the right data to keep track of performance, and establishing measures directly related to priorities. For example, the county does not have a business license requirement, so it needs third party data to identify the number of new businesses created in the county. The external data from federal, state, local or private sources may reflect different time periods or have delays in availability. Working with diverse data sources has proven to be a time-consuming task for the staff. Douglas County’s use of performance measures to evaluate the efficiency and effectiveness of its Economic Vitality Plan has helped the county make better use of its available resources. Through periodic refreshes and constant monitoring, Douglas County makes the necessary adjustments to ensure the county achieves its goals of supporting a strong economy for the health of the community. Case Study: Catawba County, N.C.
Interviewee: Mary Furtado, Assistant County Manager, Catawba County, N.C. In 1992, Catawba County, N.C. pursued a major reassessment of its organizational structure and operations to drive innovation within the organization. At the time, Catawba County was burdened with sluggish growth in revenues and increasing demand for services. Because of the reassessment, the county decided to change its budget process to place more emphasis on outcomes. The county started providing budget incentives for specific departments to facilitate innovation and more efficient resource utilization.15 Over time, this outcomes-based budgeting process set the foundation for Catawba County’s current performance management program used county-wide with all departments. Central to Catawba County’s performance management program is the county’s performance measurement process, which provides the basis for the whole program. Catawba County views its current performance metrics as tools for improving government operations, and for expanding the thought processes behind community transformation and government operations. The county chooses metrics that align with county agency or department goals. In 2013, Catawba County took another step in developing its performance metrics. The county wanted to visualize the data related to county performance, and to restructure the various metrics that were being tracked. Hence, the budget office was tasked with creating a centralized dashboard to visualize and restructure the data, which would also help the county separate priority from non-priority metrics. The performance dashboard displays the latest five years of data for each metric Catawba County monitors. The dashboard presents the data as a bar graph to clearly demonstrate whether Catawba County is improving in an area. Some data displays also show targets in relation to actual performance. With this performance measurement process in place, certain Catawba County departments have been able to transition to a form of outcome-driven budgeting (called, “reinventing budgeting”) that places performance metrics at the center of their budgeting process and rewards departments that achieve certain outcomes.17 Department heads, the County Manager’s office and the Budget Office work together to set outcomes they believe to be realistic and attainable, as well as the metrics the department will use to track its progress and report to the Board of Commissioners and County Manager. The outcomes for reinventing departments place emphasis on improving the impact of county services, on obtaining and maintaining higher service levels with limited resources and on the department achieving its overall mission.18 If they achieve at least 90 percent of their goals in a fiscal year, these departments can then retain any unspent funds for future spending. Other county departments have also transitioned to outcome-driven budgeting, though without the same budgetary incentives. Catawba County’s performance measurement process and dashboard have been quite successful in improving resource allocation and service delivery, but the county wants to continue advancing. Therefore, to further improve its metrics, Catawba County is currently developing an operational review forum to align county services with the county’s goal of growing the county’s base and facilitating job creation. This forum will allow for a constructive, improvement-focused, performance-oriented and collaborative conversation to take place so the county can better serve its residents. As departments have initiated discussions on modifying service levels or adjusting service delivery models, the dashboard has proven valuable in building context around those requests. For example, conversations on whether to adjust Library branch hours of operations have been accompanied by data on branch circulation and visitation to ensure full awareness of the impacts (both positive and negative) of such a change.19 Requests from Public Health to increase the number of staff dedicated to performing environmental health inspections have been accompanied by data from the dashboard on total workload by inspector. Review of data from the Emergency 911 Telecommunications Center uncovered that non-emergency calls were a significant driver of staff workload, representing 65 percent of the calls received in FY2017.20 This led to a dialog on potential strategies for alleviating workload compression, different than the strategies that would make sense if emergency calls were the primary driver. One challenge for Catawba County is making sure that the indicators being used to measure performance are sufficiently related to the overall goals or outcomes. When developing metrics, Catawba County connects the collected data to the analysis that the county seeks to conduct. The availability of data for tracking metrics is another challenge for the county, because some data are available on a calendar year basis or on a fiscal year basis, which ends up creating time lags in the analysis. Another challenge for the county is balancing accountability with encouraging departments to achieve their full potential. Catawba County has had to continually reassure departments that the performance metrics are primarily being used as improvement tools and mechanisms for the county to hold itself accountable to the public, and not as disciplinary means against departments. To that end, county leadership and the Board of Commissioners have also had to ensure department heads are proposing ambitious, yet attainable, goals. The changes and improvements achieved by Catawba County’s performance measurement process have not always come easily. Hence, for any other county looking to integrate performance metrics into their county operations, Ms. Furtado recommended that the county start simple and look for gradual changes in the process. Each county has its own set of priorities based on its unique situation and environment. Counties can more effectively meet the needs of residents by customizing their performance measurement process to match metrics with priorities. Performance measurement can be used to drive significant budgetary decisions and ensure optimal resource allocation. Integrating metrics into the budgeting process can help counties keep up quality services under tightening fiscal constraints. When developing performance metrics, counties focus first and foremost on objectives. Metrics should be viewed as customizable tools that counties can use to identify ways to increase quality and efficiency, thereby achieving broader county objectives. In an era of increasing financial challenges for counties, tracking performance can allow counties to identify ways to improve the quality and efficiency of their services to residents. There is no one size fits all solution. Based on county resources and priorities, county leaders may develop a performance evaluation system that best meets their county’s needs. An effective system to measure county performance may increase transparency and accountability, and, ultimately, build trust between county leaders, employees and residents. Are You a County of the Future? If you implemented a successful performance metrics process in your county, please send us the details at research@naco.org. The Counties Futures Lab is also looking for innovative ideas on affordable housing — share your county's solutions at research@naco.org. We'll feature the best solutions at NACo workshops, forums and reports throughout 2018. We’re always looking for ideas from our members! National Association of Counties (NACo), “Counties Matter” (Washington, D.C.: NACo, 2016), available at http://www.naco.org/counties-matter. Federal CIO Council, “Performance Metrics and Measures” (2011), available at https://www.cio.gov/201/08/18/performance-metrics-and-measures/ (February 6, 2018). At NACo’s 2017 Annual Conference, the NACo Counties Futures Lab conducted two live polls, two focus groups and administered a limited survey to 105 total respondents representing both appointed and elected county officials. The respondents were asked to select the top two aspects of which their county tracks performance. Choices included financial performance of county government, residents’ satisfaction with county services, county employee engagement and socio-economic trends. CountyStat, Prince George’s County, Md., available at https://performance.princegeorgescountymd.gov/ (February 6, 2018). See “About TNI,” available at https://tni.princegeorgescountymd.gov/stories/s/6jyz-zvm2, (February 6, 2018). All statistics in this paragraph come from Prince George’s County CountyStat program. National Association of Counties (NACo) County Explorer data, analysis of U.S. Census Bureau - Population Estimates Program (PEP), 2016 data. Available at explorer.naco.org. Joel Griffith, Jonathan Harris and Emilia Istrate, “Doing More with Less: State Revenue Limitations and Mandates on County Finances” (Washington, D.C.: National Association of Counties, 2016). Lisa Granahan and Wells Barnett Associates, LLC, “Economic Development Annual Performance Measures Report” (2015). “Genoa Main Street Project” (2013), Genoa Connection Newsletter, available at http://www.genoanevada.org/Newsletter_PDFs/2013_Newsletters/GCN-July2013-pg5.pdf (February 6, 2018); Lisa Granahan and Karen Craig, “Fostering Economic Vitality Amid a New Economic Reality” (2012), Government Finance Review, available at http://www.gfoa.org/sites/default/files/GFR_FEB_12_16.pdf (February 6, 2018). Lisa Granahan and Wells Barnett Associates, LLC, “Economic Development Annual Performance Measures Report,” 2015. Catawba County, North Carolina, “Summary of Outcome Budgeting: The Reinventing Process” (2017), available http://www.catawbacountync.gov/budget/risummary.pdf, (February 6, 2018). NACo defines medium-sized counties as containing between 50,000 and 500,000 residents. North Carolina has 100 counties, 51 of which are medium-sized, including Catawba County. Jennifer Mace, Barron S. Monroe II, Paarth Mehta, & Danielle Verwahren, “Catawba County, NC Fiscal Year 2017/18 Adopted Operating & Capital Budget” (2017), available at https://www.catawbacountync.gov/county-services/budget-management/, (February 6, 2018). This change in the budgeting procedure is based on the book, Reinventing Government by David Osborne and Ted Gaebler. Catawba County Budget Office, “Readers Guide and Financial Policies” (2017), available http://www.catawbacountync.gov/budget/17-18/Readers%20Guide%20and%20Financial%20Policies.pdf , (February 6, 2018). See, for example, Catawba County, N.C., Performance Dashboard, http://dashboard.catawbacountync.gov/performance-dashboard/#/reports/culture/library/catawba-county-libraries/, (February 14, 2018), which shows data on Catawba County’s libraries. See Catawba County, N.C., Performance Dashboard, http://dashboard.catawbacountync.gov/performance-dashboard/#/reports/public-safety/e-communications-center/general-service-measures/total-call-volume, (February 14, 2018). See Catawba County, N.C., Performance Dashboard, http://dashboard.catawbacountync.gov/performance-dashboard/#/reports/human-services/public-health/child-and-school-health/%25-of-children-receiving-ageappropriate-immunizations-by-24-months-of-age, (February 14, 2018). 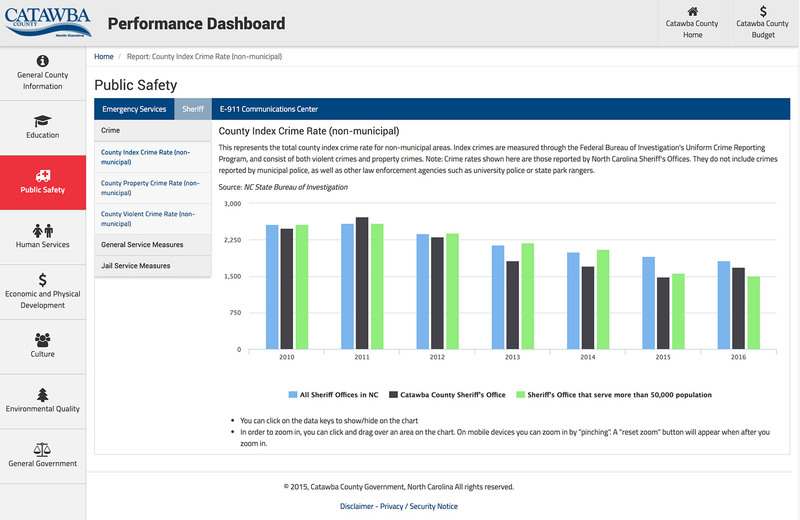 See Catawba County, N.C., Performance Dashboard, http://dashboard.catawbacountync.gov/performance-dashboard/#/reports/public-safety/sheriff/crime/county-index-crime-rate-nonmunicipal, (February 14, 2018). See Catawba County, N.C., Performance Dashboard, http://dashboard.catawbacountync.gov/performance-dashboard/#/reports/economic-and-physical-development/utilities-and-engineering/building-services/value-of-building-permits-issued, (February 14, 2018). The authors would like to thank Peter Austin (McHenry County, Ill.), Benjamin Birge (Prince George’s County, Md. ), Mary Furtado (Catawba County, N.C.), Lisa Granahan (Douglas County, Nev.) and Linda Turner (Prince George’s County, Md.) for providing essential information and comments for this study. Without them, this project would not have been possible. The authors would also like to thank those who participated in the live polls, focus groups and survey at NACo’s 2017 Annual Conference and Exposition that provided additional information for this study. Within the National Association of Counties, the authors would like to thank Christina Iskandar, Andrew Hartsig and Ricardo Aguilar for their helpful comments and contributions. A big thank you goes to Kelsey Wilson for providing helpful feedback. The authors also express their appreciation to their Public Affairs colleagues for the graphic design and the website of the report. As NACo Counties Future Lab managing director, Emilia Istrate leads policy analysis, analytics and knowledge sharing efforts, as well as thought leadership to support and advance the interests of county governments. She is part of NACo’s executive leadership team.